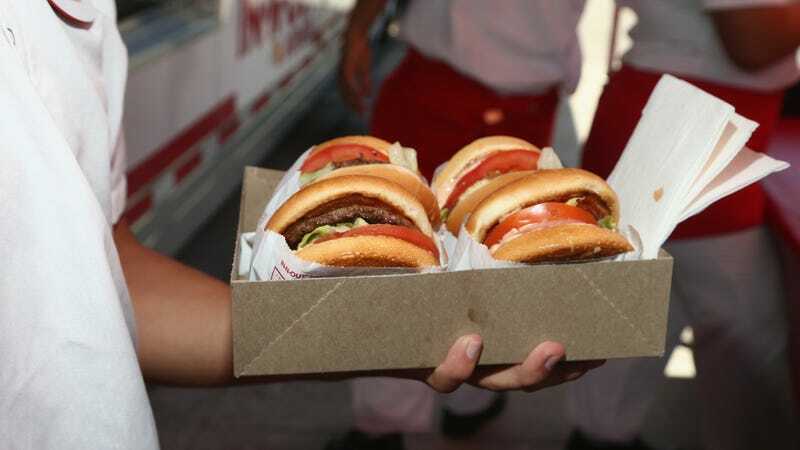 We reported yesterday that all Texas locations of In-N-Out had reopened after a mysterious “bun problem” forced them to close for two days earlier this week. The restaurant chain was tight-lipped about what the exact bun issue was, saying only that the bread didn’t meet quality standards, but also didn’t pose a health risk. Today the bun blight appears to be spreading, as Raising Cane’s has pulled its Texas Toast—in Texas, no less—over quality concerns, and Whataburger has also stopped serving toast and buns in three states, including Texas. What the hell? According to Nation’s Restaurant News, the Whataburger buns and toast also didn’t pose a health risk, but there was “an impact on our bun’s flavor caused by an unbalance in the yeast” that made them less tasty. And as for Raising Cane’s, WFAA-8 reports that again, it’s not a food safety but a quality problem, and the affected locations will offer customers an extra chicken finger or side item to make up for the lack of bread. The restaurant chain hopes to have the issue resolved today. What some outlets are now dubbing #bungate18 raises a few questions for us: Do all these restaurants’ buns come from the same mega factory? Is there just something in the air in Texas that’s screwing with our fast-food carbs? What happened to presumably truckloads and truckloads of yeast-unbalanced buns? Can we get 60 Minutes or at least Harriet The Spy on the case? For now, fast food companies aren’t sharing deeper details, but we’ll be sure to share them should they come to light.